Plasticine sculpt. Body armeture in Ply and PVC. bird head sculpt in sculpy. pattern in masking tape, enlarged and reconstructed in foam, then painted with acrylic. head and tail cardboard and acrylic paint, body and fins flexible plastic inner with plastic scales. 100% reused, reclaimed and recycled materials. fabric hand dyed using natural vegetable dyes. 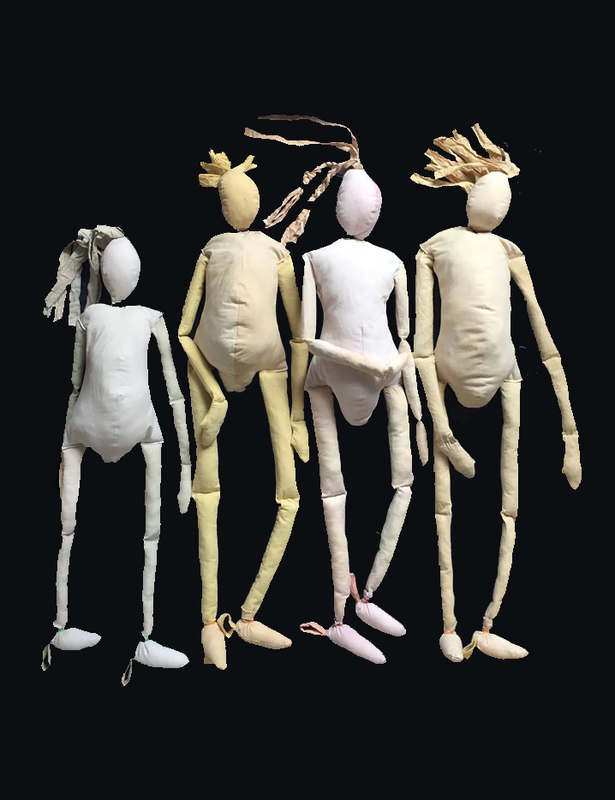 cotton, tabletop bunraku-style puppets with newspaper and wadding filling. created for act one drama studio Sheffield. head carved in lime wood. head and hands in lime wood. arms, torso and hip in jelutong. painted in acrylic, texture with crayon. skirt in silk and cotton with feather headdress.